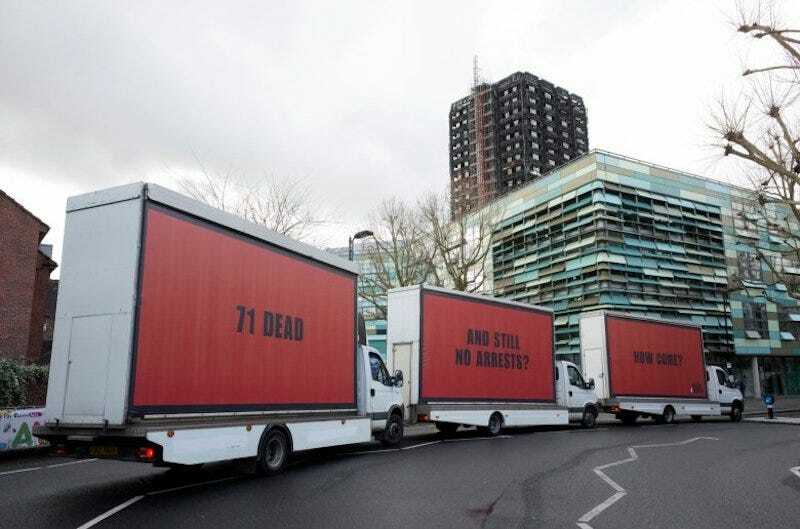 An activist group demanding justice for the 71 people killed in a fire at London’s Grenfell Tower in June have taken inspiration from the Oscar-nominated film “Three Billboards” in a campaign on Thursday. The group is seeking prosecutions for the fire, which police said in September could have been caused by a fridge-freezer malfunction. An activist group in London, England, has taken inspiration from the Oscar-nominated film “Three Billboards Outside Ebbing, Missouri” to pressure Parliament into finding a resolution to a fire that killed 71 people and injured 70 more at London’s Grenfell Tower in June of last year. British Prime Minister Theresa May ordered a full public inquiry into the fire in July. The inquiry had its first hearings in September, and the latest development was a police statement in September that said the fire could have been caused by a fridge-freezer malfunction. But the “Three Billboards”-inspired campaign is seeking more concrete answers and “prosecutions” for the disaster.